I feel like I’ve been waiting years for this. The first real footage of Star Wars Battlefront — an EA-made sequel to the wonderful first person shooter of the same name that LucasArts (RIP) made back in 2004 — just dropped at E3. Unlike previously released footage (which was made with the game’s engine but all pre-rendered) this clip is said to be ripped straight from actual gameplay running on a PS4. I’m perhaps more excited about this than I am about The Force Awakens. Okay, probably not — but it’s close. 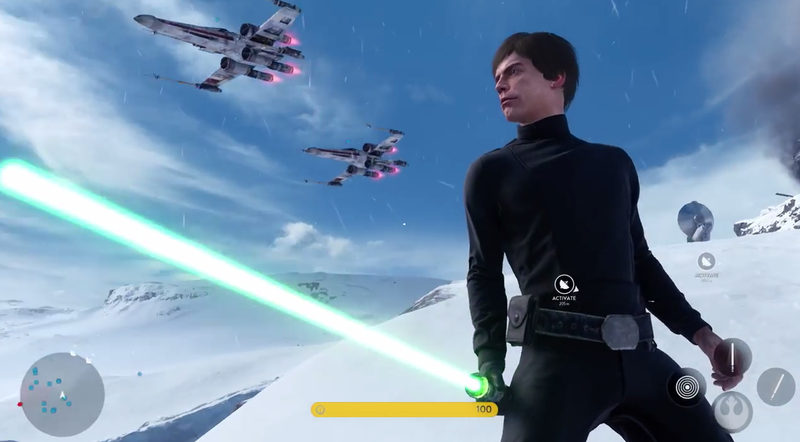 For anyone who never played it, Battlefront is what happens when you take the Star Wars universe and smash it into a first person shooter with epic, 40-person multiplayer battles. Hoth! Flyable TIE fighters versus flyable X-Wings! AT-ATs versus snowspeeders! Lasers! THE LAAASEEEERS. Fans have been begging for a new Battlefront game for over a decade now — but, despite a number of attempts, LucasArts just couldn’t get one out the door. After LucasArts got shuttered by Disney back in 2013, EA DICE — creators of the popular Battlefield series and the Frostbite game engine that powers most of them — got their hands on the license and ran with it. I’ve been burned by putting my faith in EA once or twice before — I’ve come to more or less expect their wares to have game-breaking bugs on launch day. But with a brand like Star Wars at play (under the watch of Disney, no less), we can assume/hope that the “good enough” bar is set sky high. The new Battlefront will ship November 17th, 2015. I can’t friggin’ wait.